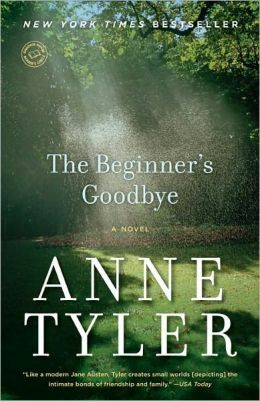 a book chick: "The Beginner's Goodbye"
my take: I love Anne Tyler's whacky and wonderful characters. It doesn't matter which novel of hers you pick ... they're all slumpy or frumpy and flawed. Nobody's really got it together. These are my peeps. Aaron, Beginner's main character, is a gem of an example of Ms. Tyler's deft characterization. "The strangest thing about my wife's return from the dead was how other people reacted." Love! It sets up the novel beautifully and made me want to read on. Funny, sad, true, fantastical. and I love when the cover art choice becomes apparent after you've read the novel as it does for this one. I can't wait for her next book. Very interesting - I picked up the hardcover version from the library a while ago, and the cover art is completely different. Loved this as with all Anne Tyler.